Our Favorite Movie Posters: # 9 - Attack of the Killer Tomatoes! 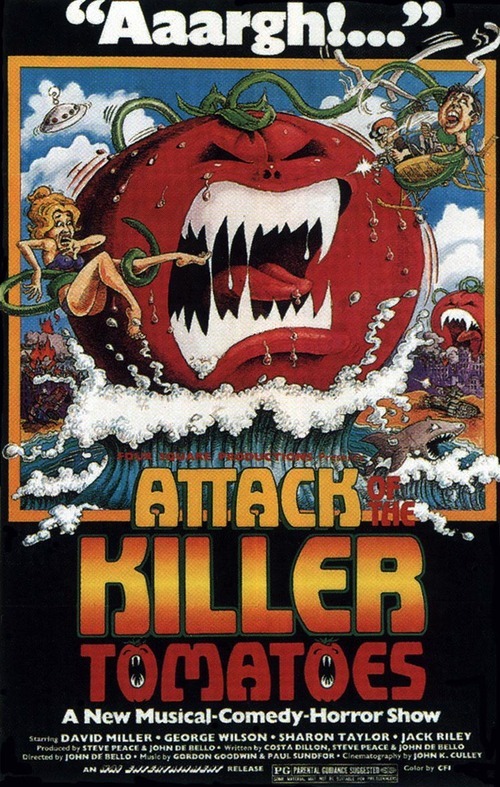 attack_of_the_killer_tomatoesStoryline: (From IMDB) After a wave of reports of mysterious attacks involving people and pets being eaten by the traditionally docile fruit, a special government task force is set up to investigate the violent veggies and put a stop to their murderous spree. Included in this crack team are a lieutenant who never goes anywhere without his parachute, an underwater expert who's never out of his scuba gear, and a master of disguise who conceals his appearance by dressing as a black Adolf Hitler. "Attack of the Killer Tomatoes!" is in my opinion one of the best bad movies ever made. This is basically a spoof of bad sci-fi/monster movies. Bad acting, cheesy but memorable lines, lousy special effects, it's all here for you!